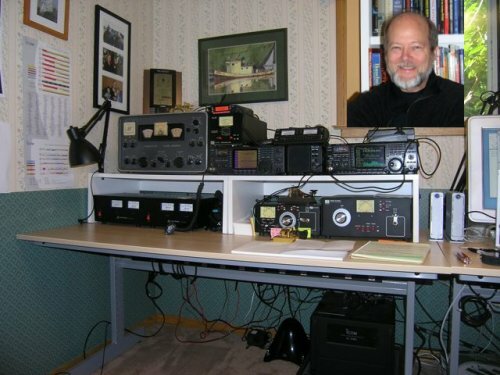 I got back into ham radio in February 2004 when I passed my Technician and General in a single sitting. I had credit for my 5 wpm code from my Novice license I held in the mid-1960s. A few months later, after spending a week in Hawaii studying, I aced the Extra class test. I was on the air for the first time in almost 40 years on March 2nd, 2004 and I have been on the air almost every day since only taking time off for vacations, business trips, and a few power outages after heavy windstorms. In January of 2007 I got the itch for CW again (my best novice speed was about 20 wpm). I started listening to the bands to see if I could drag that old CW memory that was at least 40 years old. At the time I did this, I don't think I could tell you half the Morse Code alphabet if you asked me. I couldn't tell you the difference between an L or an F but when I heard them I knew them. After only a week of listening, I think my copy speed was up to about 7 to 10 wpm and I tried my first QSO. What a flop. I had to abandon that because I forgot that I also had to practice sending on my key. I just took it for granted that if I could copy code I could send it. So, practice, practice, practice. After about a month of that, I graduated to an iambic paddle and today I am comfortable at 18 wpm, but will handle 20 to 25 wpm if I am allowed to miss a few here and there and I have done a contest here and there at 30 wpm. Me listening at 30, not sending. I still max out my sending speed at around 22 to 25 wpm. More practice is needed. Today, I am 90 percent CW hanging out on 20, 30, and 40 meter bands mostly and if it is not too noisy I might show up on 80 meters around 3550 or so. Career? I retired five years ago from 30 years with the same company -- a company that I helped start with a group of other engineers and mathematicians. I will still do a consulting gig here and there for about 40 percent of the time. Background is Physics, Math, Computer Programming, and power system engineering.